More than 29 works by Allen Sapp are on display on the sixth floor of the Agriculture Building. Renowned Cree artist Allen Sapp died in December 2015, leaving behind a remarkable legacy of paintings. Allen Sapp’s collections can be found around the world—but one of the largest collections is right here on campus. The Allen Sapp collection on the sixth floor of the Agriculture Building is a highlight of the College of Agriculture and Bioresources' art collection. "Our art collection is a unique feature that highlights our broad, deep connection to this province," said Dean Mary Buhr. "Our Allen Sapp collection, donated through the generosity and public spirit of Henry and Cheryl Kloppenburg, is of special interest because of the number and nature of the pieces." 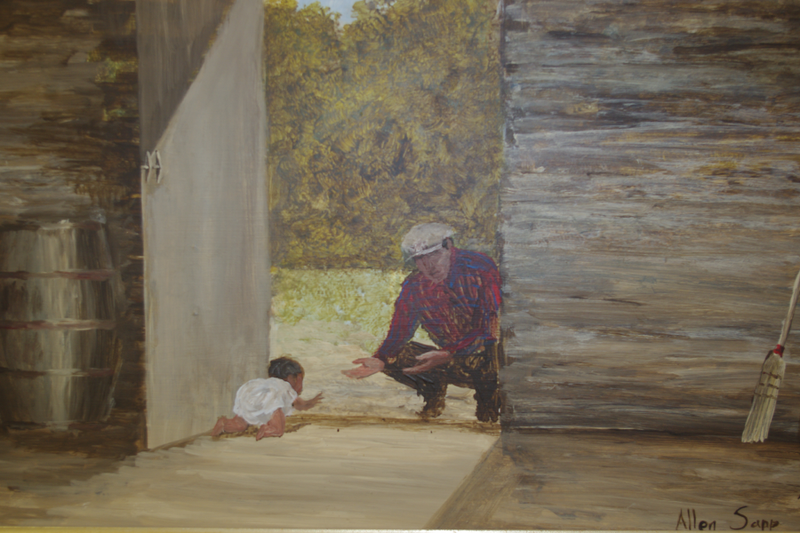 "Allen Sapp's paintings resonate with people—especially prairie people—because they reflect a connection to the land and to the seasons," said Gary Storey, professor emeritus, who manages the college's art collection. "We have 23 of his paintings, mostly earlier works from the 1960s and 1970s." Born in 1928, Sapp grew up on the Red Pheasant Reserve south of North Battleford. His evocative paintings of life on the reserve during the Depression-era captured the public imagination from his first exhibition in 1968. By 1970, his works were showing in London and Los Angeles, and by 1975 he had been elected to the prestigious Royal Canadian Academy of Arts. "Sapp painted what he knew and remembered—a life of simplicity," Storey said. "What resonates even more are his titles: ‘Having rabbit for supper,' ‘Got a prairie chicken,' ‘Will be eating soon,' ‘Stopping for a smoke'—they're delightful." Storey shares how the college came to house such a collection of Sapp paintings. "It goes back to 1990, when the new Agriculture Building was opened. I was a professor in the Department of Agricultural Economics at the time, but I was also an artist so Dean John Stewart asked me to chair a committee to find artwork for the new building. Our philosophy was to support Saskatchewan artists, particularly new and emerging artists." When a sixth floor was added to the building in 2000, it opened a whole new venue for art. At the same time, Storey heard that the Kloppenburgs, well-known patrons of the arts, were interested in gifting some of their art to the university—with the proviso that it be displayed, not put in storage. "We had this wonderful new space on the sixth floor, so we invited the Kloppenburgs to come have a look. Henry was delighted and that led to the first round of donated paintings, which included seven Allen Sapps," Storey explained. The Kloppenburgs made further gifts in 2007 and 2012, including 55 pieces that make up the Collection of Inuit Sculpture on the second floor of the building and more than 50 paintings on the sixth floor, including 22 of the college's 23 Allen Sapp paintings. "One of the most important aspects of our collection is that almost all the works we've purchased or been gifted are on permanent display. The Kloppenburgs are very proud of the fact that they can come and see the paintings and sculptures they've gifted," Storey said. "The Kloppenburgs love that our art works are always displayed for the public," added Buhr, "and we sincerely enjoy showcasing to the world our unique blend of world-class art and agricultural science." Today, 26 years after chairing the first art committee, Storey continues to look after the collection, working closely with the dean's office and staff at the university's Kenderdine Art Gallery. "This collection is a passion for me, certainly, but everyone connected with the college— students, staff and faculty—are very proud of what we've got." Bev Fast is a Saskatoon-based freelance writer.